Sri Lanka is truly spellbinding and will suit any traveler’s interests with its top tourist attractions. 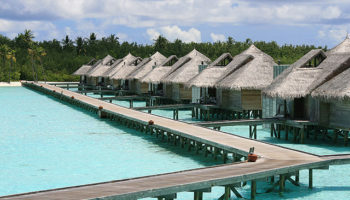 The small island nation is chock-full of adventure activities like surfing and trekking. There are several highly religious sites for the religious devotee, and unbelievable historical relics for history buffs in Sri Lanka. 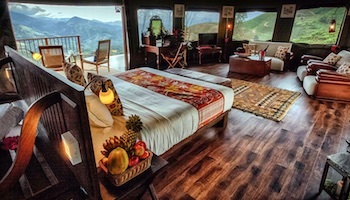 However, no one can dispute Sri Lanka’s incredible natural beauty. Whether it be en-route to a perfect surf break, visiting a historical site or on a pilgrimage, lush greenery and exotic animals are never far away. One of Sri Lanka’s most iconic sights is the Nine Arch Bridge in the small mountain town of Ella. 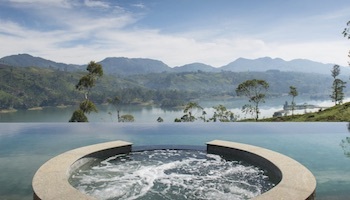 This viewpoint offers spectacular panoramas of the surrounding area, which is made up of verdant greenery and tea fields. Visitors can watch trains roll over the bridge as they make their way along the Demodara Loop. Constructed in the early days of the railway expansion in Sri Lanka, the bridge is particularly impressive because it is made of cement, stone and brick, without the use of any steel. Mihintale is a mountain near the town of Anuradhapura. 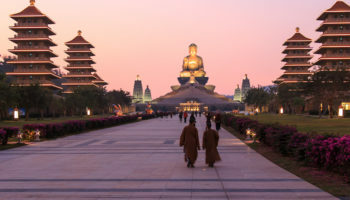 Its summit has much spiritual significance to the Buddhist community. 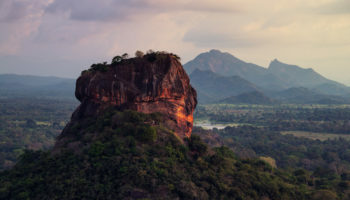 It’s believed that on this mountain top a Buddhist monk named Mahinda met King Devanampiyatissa and together this meeting introduced Buddhism to the country. Monk Mahinda impressed the King with the peacefulness of the Buddhist doctrine and his contented, serene nature. The King subsequently renounced war, and went on to spread peace throughout the nation. There are several impressive religious and historical structures on and around Mihintale Mountain. Hundreds of pilgrims visit the site each year. 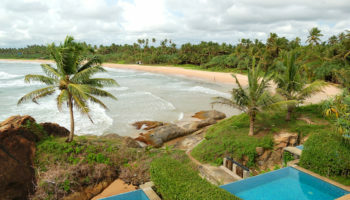 This white sand beach in the small seaside town of Unawatuna is a great place to relax. There are a number of snorkeling and diving operators in town who take advantage of the abundance of coral reefs just off the beach. Colorful fish and plentiful turtles are the norm in these waters. There are a number of great dining options along the beach, which welcome visitors to use their sun loungers and relax the day away with a drink in hand. Visitors can find Gal Viharaya in the ancient city of Polonnaruwa. Gal Viharaya is a famous Buddhist site and is celebrated for its many caves and large sculptures of Buddha which are carved into the rock faces. They are extremely well preserved, even though they were crafted in the 12th century. To the side of one of the statues, a code of conduct is inscribed. The code, when followed, was meant to purify the Buddhist monks and bring them together under one order. It was created by a very famous king: King Parakramabahu the first. Today, Gal Viharaya is one of Sri Lanka’s most popular sites of pilgrimage. 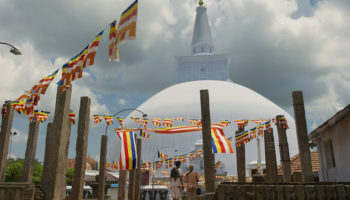 One of the most popular tourist attractions in Sri Lanka, the Kataragama Festival takes place every year in July or August and is dedicated to one of the Hindu gods. It takes place over a two-week period and people from all over the world come to join in. The festival is jam-packed with parades of elephants and colorfully dressed performers. There are countless traditional dances that take place; with musicians, acrobats, and fire-breathers feeding into the festival’s contagious energy. There are few places in the world where elephant sightings are so frequent. However, elephants are not the only animals to see within Udawalawe National Park; peacocks, jackals, water buffalo, crocodiles, monkeys and deer also roam the area. 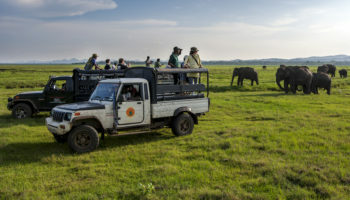 Safaris are most popular in the early morning hours when animals are at their most active. The biodiversity of the park can be attributed to its varied landscape; it is flanked by mountain ranges to the north with wetlands and rivers hugging the grasslands and forests at the base of the mountains. The beautiful Ravana Falls are used for bathing in the hot summer months. In the rainy season, the water flow is exceptionally strong and is an impressive sight. The falls are part of the Ravana Ella Wildlife Sanctuary, and the nearby cave complex is rich in local legend. Conveniently located on the main road on the way to Ella town, the caves are a common stop off point for visitors during their journey. Many cheeky monkeys live in the surrounding trees and they are often seen on the roadside dining on fruit. However, don’t let them get too close, as sometimes they can get over-friendly with visitors. The Dambulla Cave Temple is a sacred Buddhist site. There is no entry fee to get into the temple on full-moon days; however, these days are especially busy because of the religious significance of this lunar phase. Devotees from all over the world make pilgrimage to this place. There are over 80 caves documented in the area, but the most famous five are outfitted with impressive statues and paintings. Some of the caves date back to 1000 BC, when prehistoric Sri Lankans would have lived within them, so it is unsurprising that they would have created temples inside at that time. If you do plan to visit, please be aware that visitors must cover their shoulders and legs and remove shoes before entering the temple. 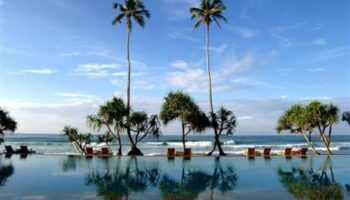 Mirissa is the ultimate Sri Lankan beach getaway. The beautiful long beach is flanked by tall overhanging palm trees and lined with modern restaurants and hotels. The restaurants have western style food at Sri Lankan prices. Just off the beach is Parrot Rock. It has a small staircase leading to the top that offers great views of the ocean and coastline. Day trips from Mirissa include whale watching, snorkeling and surfing. Weligama, just a few kilometers from Mirissa, is one of the best beaches in Sri Lanka to learn surfing. Come happy hour and into the evening, many the restaurants turn their venues into beach clubs and pump out drinks and tunes. Arugam Bay is revered by surfers. This small town on the east coast of Sri Lanka embodies the quintessential laid-back surf lifestyle. The Main Point surf break is within walking distance from the town center, but is only recommended for advanced or intermediate surfers. Otherwise, Whiskey Point or Peanut Farm are two great surf beaches for beginner and intermediate surfers; a short tuk-tuk ride will take you there. Often elephants and peacocks can be spotted beside the road, just outside of town. 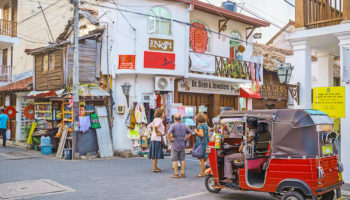 The main strip in Arugam Bay town is lined with restaurants and hotels where you can dine on anything from traditional Sri Lankan curry to full English breakfasts. The Temple of the Tooth is a highly sacred place. The temple contains one of Buddha’s teeth. Legend has it that the tooth was taken from the Buddha on his deathbed, then smuggled to Sri Lanka from India. It was smuggled in the hair of a princess, after her father’s kingdom had been besieged. It immediately became an object of great importance and has been celebrated and paraded throughout history. However, many attempts have also been made to steal or destroy the tooth. Twice daily, pujas are held to celebrate the relic and offer visitors and devotees the chance to get a glimpse of the tooth within its casing. At the summit of Adam’s Peak is a footprint cast in stone. It has spiritual significance to a number of different religions, however, there is currently a Buddhist monastery at the summit. To the Buddhists, the footprint is that of Buddha’s; to Christians, the footprint is Adam’s; and to Hindus, the footprint is attributed to Shiva. The site is a popular place of pilgrimage, especially on full moon nights. The trek to the top of the mountain to see the footprint is via a steep staircase containing over 5000 steps. The trail is lined with many tea stalls and food shops which act as places of rest. Most people begin their hike at 2:30 am to reach the summit in time for sunrise. It is easy to get lost in the cobblestoned alleyways and streets within Galle Fort. 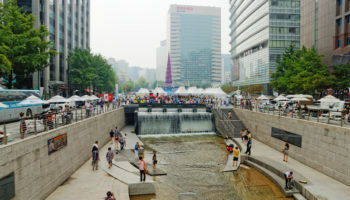 Today the area is full of modern restaurants, hotels, clothing, and souvenir shops. Meanwhile, snake charmers and buskers line the seawall. However, the fort was not always such a cosmopolitan spot. A basic fort was constructed by the Portuguese when they made their first landing to the island in 1505. 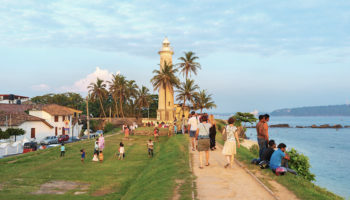 When the Dutch eventually seized control of Galle, they made a number of improvements; including the enormous sea wall that still lines the fort. Galle Fort is an excellent example of what the synthesis between European and Asian architecture looks like. Yala National Park is made up of spellbinding vistas and a true abundance of Sri Lankan wildlife. It has the highest density of leopards in the world, so chances of seeing them are very high. Although leopards are the main attraction here, they are followed closely by elephants, sloth bears and crocodiles. The park is divided into five blocks; some of which were zoned to hunters until Yala became a national park in 1938. Ensure you make time to visit the very informative visitor center at the entrance of the park for insightful displays about the area. Sigiriya Rock Fort is utterly impressive. The rock walls rise up 200 meters from the ground, only to give way to a flat plateau at their summit. There are steep stairwells to reach the top and many frescos to marvel at on the way up. At the top, you can find the remains of an ancient civilization, including relics of a palace and monastery. It would have taken true engineering ingenuity to build a structure at this height so many centuries ago. Around the rock fort are many important caves and gardens; impressively, they are some of the first landscaped gardens in the world.